« Climate news got you down? Here are 3 bright spots that show promise in building resilience. A new open-source sustainability guide [PDF] provides a roadmap for the dairy industry to improve water quality and foster economic and environmental resilience at a critical moment. 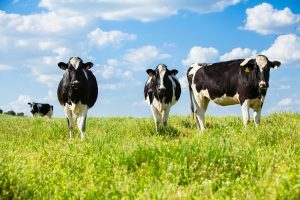 For dairies throughout the Chesapeake Bay watershed, becoming more economically and environmentally sustainable has never been more important. Adopting on-farm conservation practices such as improved nutrient management and manure storage offers often-overlooked opportunities to improve operational resilience and manage environmental and economic risks. While many sustainability changes happen on the farm, responsibility for improving environmental outcomes is shared throughout the supply chain. Dairy cooperatives and processors are a linchpin for industry-wide sustainability progress. These businesses have strong and direct relationships with the majority of dairy farmers in the region and engage directly with milk buyers and retailers. Implementing sustainability strategies can help meet growing consumer demands to know where and how their food was produced, address regulatory pressures around water quality, improve community relationships, reduce supply risks caused by extreme weather, and sustain yields over the long term. EDF just published a new resource to make getting started on sustainability seem less daunting. Developed with input from a diversity of experts and stakeholders, including members of the dairy industry, Water Quality Guide for Dairy Sustainability in the Chesapeake Bay [PDF] provides dairy cooperatives and processors with tools and training to make measurable environmental and economic progress. Identifying goals and desired outcomes. Developing or selecting a data collection platform or process for tracking progress. Developing an on-farm continuous improvement program for participating farmers and their advisers. Supporting farmer participation and rewarding results. Communicating results to customers, communities and other important stakeholders. With the information and additional resources identified in the guide, cooperatives and processors can move forward on water quality regardless of their size, budget, or whether or not they have a dedicated sustainability expert on staff. Working with government programs and nonprofits identified in the guide, as well as connecting with trusted farmer advisers, are cost-effective options. The dairy industry is vital to the Chesapeake Bay region’s economy, culture and environment. Proactively addressing water quality is vital for the near- and long-term wellbeing of the dairy industry, the communities that depend on the sector, and the quality of the region’s natural resources. As pressures on the dairy industry mount, the recommendations in this guide will help dairies advance meaningful solutions to water quality challenges, realize economic value from sustainability and meet growing demand for corporate stewardship. We welcome an opportunity to help you put this guide to use to advance water quality goals in collaboration with member and supplying farmers. This entry was posted in ecosystems, Partnerships, Supply Chain, Sustainable Agriculture and tagged Chesapeake Bay, dairy, sustainability, water quality. Bookmark the permalink. Both comments and trackbacks are currently closed.